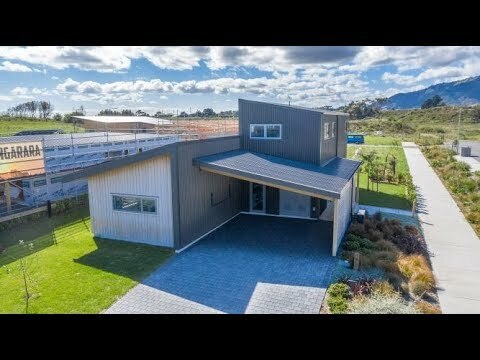 Located at Ngarara in Waikanae, this is a flagship development of sustainable housing is designed to meet the New Zealand Green Building Homestar Standard. 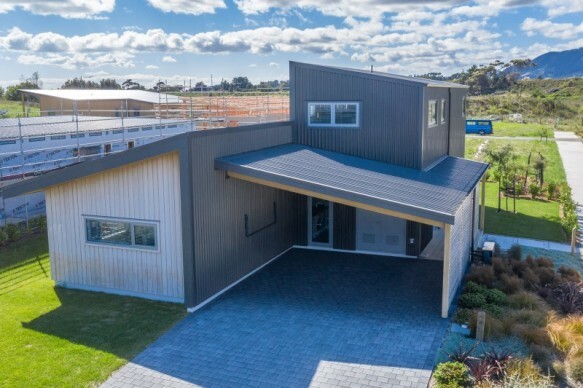 The show-home at 43 Te Ara Kawakahia has been awarded a 7 Homestar rating. The energy centre is like lifting the bonnet on a sportscar, we've an Aquarian cylinder that provides a massive saving on hot water costs, a battery system to store energy from the solar panels and in the laundry, there is a hydronic underfloor heating manifold that can warm the house slab like a giant radiator. Inside, the home is whisper quiet with 6-inch thick walls packed with double the insulation of an ordinary home and there's Low E thermally broken double-glazed windows. The living, kitchen and dining are open concept with uplifting high ceilings. The show-home includes European quality appliances, engineered stone benchtops and soft recessed LED lighting. The warm tile floors feel amazing with the hydronics. There are three double bedrooms, the master suite has a second lounge for retreat, plus a quality ensuite bathroom. The level threshold to outdoors is a nice touch with grounds that are fully landscaped. The predesigned architecture ensures this home integrates with its neighbours to optimise aesthetics and space. Covered parking for two cars provides a versatile space and a storage shed for your hobby gear. Proximity to the expressway interchange, and the imminent Transmission Gully Motorway will reduce city travel times whilst you enjoy all the beauty of Waikanae, the beach-cafe culture and the golf course right next door. This is a high-performance feature packed sustainable home with a ton of extras - it's on the market and you can own it today!